Would you like to learn how you can Bounce-Back from high-pressure more quickly? 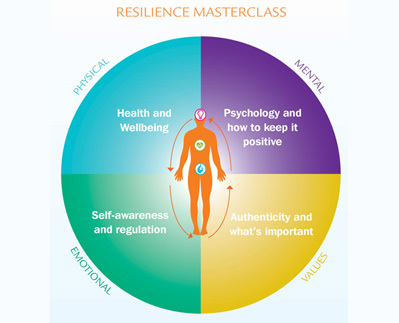 The Resilience Masterclass session will explore how Resilience raises the capacity to perform consistently whilst achieving balance and wellbeing. During this interactive session participants will learn techniques to change their response to stress, enhancing their ability to recover from challenge and change. Gain control over reactions and take advantage of a comprehensive approach to managing the pressures we face in today’s fast-paced life. Presented by a range of trainers to suit your audience, each session will illustrate practical ways of dealing with issues and lifestyle considerations. Resilience Masterclass’ enable participants to consider new ways to effectively manage and prepare for challenges as they arise with clarity, increased self-awareness and Resilience.